This document discusses what the Document Expiration Period is, the default expiration period and how you can change it to suit your KB Group's needs. When a KB site is created, a default Document Expiration Period is set for four years from the date when the draft document is created. If the default expiration period does not meet the needs/requirements of your KB group, you can change that to a more suitable time period. Navigation: SitePref tab > Group Spaces link > Groups Spaces screen. On this screen, you will see a table, your KB Group Name should be at the top of the list. 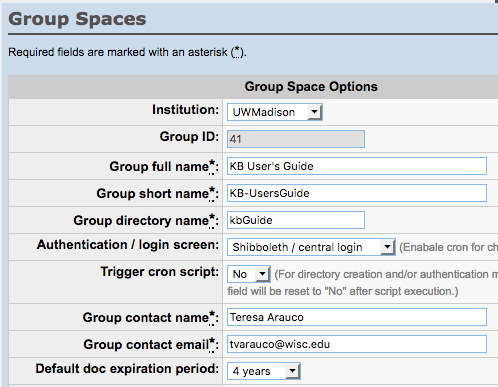 Click the Edit button on that line and you will be led to the Group Spaces Options form for your KB Group Space. In the Group Space Options form, go to the Group contact email under which is the field Default doc expiration period. Select the desired Default doc expiration period (from 1 year to 20 years or Never) from the dropdown menu. Scroll to the bottom of the screen and click the Update button. The default doc expiration period configuration is group specific (e.g. your update here will not affect any other KB sites, nor any KB sites with whcih you share content). If your group's default period is set to 1 year, for instance, the time difference between the pre-filled "Activation" and "Expiration" fields on the draft creation screen will be 1 year. The pre-filled values of these two fields can be overridden when needed. KB Admins, if you wish to update the Document Expiration field of a large group of documents, please review the content in this document.